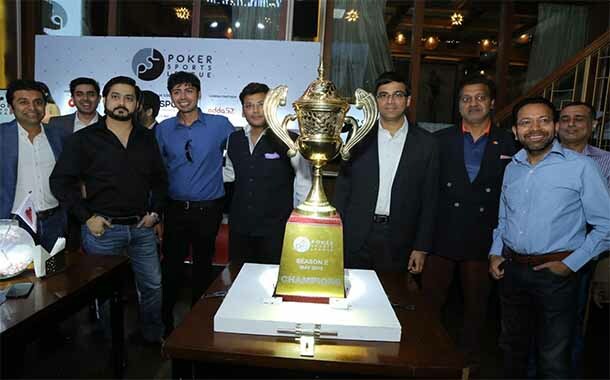 Delhi: Poker Sport League has formed a distinct identity with renowned names both From within & outside the industry associating themselves with the league which includes legends like Chess Grandmaster and Padma Vibhushan award winner Viswanathan Anand who was roped in as the brand ambassador of Poker Sports League (PSL) last November, has helped bring in a fresh perspective to the paradigm by getting the conversation rolling which is ascertaining the debate around game of chance & game of skill when it comes to Poker. “The whole idea of my association with the league lies in the fact that I find poker no different From chess & through this alliance we are hopeful that we are able to give the sport the long due prominence & acceptance. The sport has been internationally acknowledged & recognized & Poker Sports league is an attempt to furnish a platform for the immense poker talent we have in the country”, said Chess icon, Viswanathan Anand while attending a PSL press conference in the capital. Poker Sports League is the brainchild of Mr. Amit Burman, Mr. Anuj Gupta and Mr. Pranav Bagai which was established last year, with a mission to establish poker as a sport in the country. It is India’s first professional poker league, which gives opportunity to state level teams & all poker lovers to become a part of the league & learn From the best poker players in India. The league will see commitment of 8 years From 11 teams & 20,000 player participation across India. This seasons wild cards represent 11 countries. The PSL team is gearing up for Season 2, which is scheduled for May 9th to May 13th in Goa. Season 2 will see 11 city-based teams From across the country competing for a whopping prize money of Rs 3.60 crore. The teams this year will consist of a total of 10 players each, comprising of one mentor/ playing captain, two pro-players, two From free live qualifiers, three From free online qualifiers and two wild-card entries.